till I’m on the beach in the Bahamas:) This Atlantis Resort is quite the place (I may even get the opportunity to see a Regis & Kelly Live show while there). I can’t wait to give thanks this Thanksgiving with my family on the beach away from all the normal hustle and bustle at home (if we survive Philadelphia Airport Thanksgiving Morning…and the flight…so afraid to fly). Done rambling. How appropriate but to make a card with a “beach theme”. 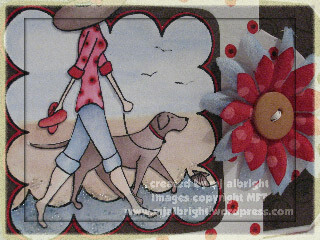 This was made with a new MFT magnetic tag card (great for holiday gift cards) & Daisy Box Blend Flowers (holiday mix). I just sponged Bordering Blue ink to the white flower so it coordinated with my card and ribbon. Ahhh, wondering how the tag card is going to fit in the provided envelope? 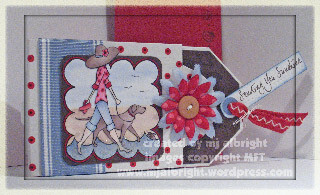 The sentiment swivles so it can be turned in to the inside of the tag card. The water…..oh so refreshing (and did I mention 1 day to go…he! he!) It was watercolored with Bordering Blue ink, color spritzed with Bordering Blue Stampin’ Write Marker, added some Micro Beads and Crystal Effects. This was a very fun card to make. I included some upclose photos below to show more details. 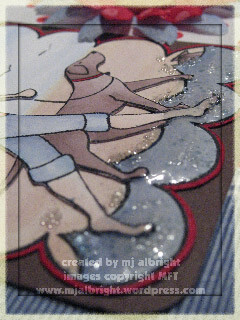 CARDSTOCK USED: Chocolate Chip and Bordering Blue CS (SU! ); White CS (Papertrey). INKS USED: Chocolate Chip, Real Red, Blush Blossom, Bashful Blue, Creamy Caramel Classic Stampin’ Pads; Real Red Stampin’ Write Marker; Stazon Jet Black ink. ACCESSORIES USED: Crystal Effects; Micro Beads; Aqua-Painter; 3-16″ Corner Rounder Punch; Crop-A-Dile 3/16″ Circle Punch; Jersey Ribbon Originals; White Thread; Sakura Black pen for leash and nose; Color Spritzer Tool; 1/2″ Circle Punch; Earth Elements Colored Buttons. Oh MY that is gorgeous!! I love all the upclose details you show!! Im green with envy!! Atlantis??? *gasp-sigh* !! Happt Thanksgiving and have a wonderful time!!! happy thanksgiving to you and I hope you have a blast at the beach 🙂 I can’t wait ’til I’m done with my exams to have time go to the beach.. is getting very warm down here!! Wow, I love all of the awesome elements in this card! I scallop and water are to die for! I hate to fly too~ I will say a prayer for a safe and fun trip! I will have to watch Regis and Kelly to see you on tv! Have a happy thanksgiving….pick me, pick me!!! LOL! Oh my goodness!!!!! Awesome card. I love the Christmas card below too. FABULOUS. Enjoy your vacation. Sounds like a dream. It is dark, cold and rainy here. BORING! Another fabulous card! The close-up shots are great…that “water” you made is awesome! Have a wonderful Thanksgiving with your family and a safe, fun trip! Wow Mary Jo! What a fantastic tag! And have a WONDERFUL time in the Bahamas! Great card! I love the way you did the water! Have fun at Atlantis! The aquarium and the casino are spectacular! Love the card! Oh how wonderful the beach sounds right about now. I’m busy here getting ready for Turkey dinner tomorrow for the in-laws … they often leave me feeling not so wanted, I’m just the girl he married not really one of them so I am feeling nervous about everyone being here, in our home, for a special day. I hope it turns out yummy and fun *keeping fingers crossed and praying hard* Back to work. Have fun – Enjoy your family – enjoy the sand too! (Thanks for the fun blog filled with inspiration). This tag card is amazing! Happy Thanksgiving and have a fun trip! Have a great flight and enjoy your break away! This is just awesome! What a great tag. . .LOVE how it’s put together!